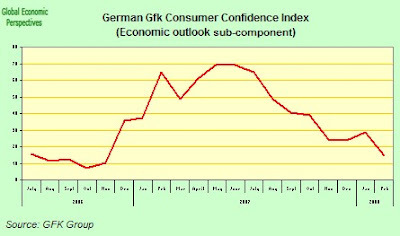 German market research group GfK's forward-looking consumer climate index was unchanged at 4.5 points in March 2008 from February. Since the forward index is unchanged at a rather low level this is not especially positive news. The slight improvement in economic expectations apparent in January has not been sustained for long. After rising by a good 5 points at the start of the year, the indicator dropped considerably in February and fell 14.1 points to stand at 14.6. A decline of this order of magnitude has not been since the end of 2006. The evolution in this index does not look at all positive, to say the least. Then we have the propensity to buy. 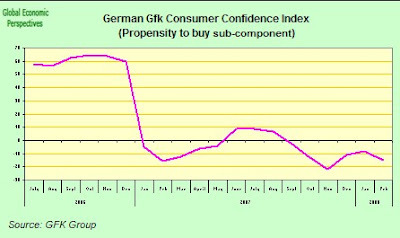 After two consecutive rises in a row, consumer propensity to buy in Germany dropped back significantly in February and the indicator fell from minus 8.8 points in January to minus 15 points. This index is now well bogged down in negative territory, which is entirely consistent with the contraction in domestic consumption seen in Q4 2007. Finally income expectations. After a slight dip in January, income expectations rose again this month, with the indicator climbing 4.2 points to its current level of minus 0.5 points. 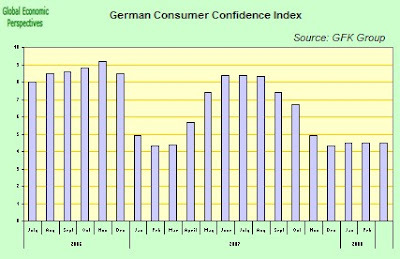 After two slight falls in a row, consumers’ expectations regarding their own financial situation are therefore once again at the level recorded in November 2007. 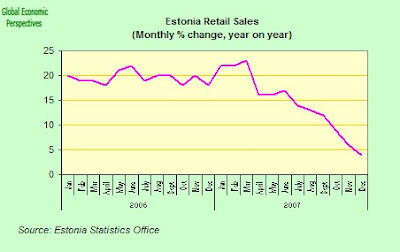 As we can see, this has stabilised and even improved very slightly in the last couple of months. 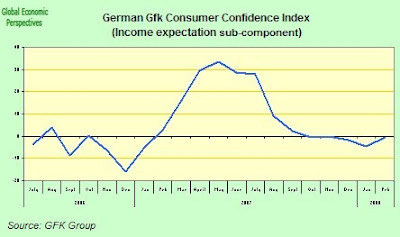 Unfortunately, this is likely to be the most carefully watched indicator over at the ECB, and this sudden revival in income expectations is just what they don't want to see. Basically the distribution of the sub components would seem to be the worst of all combinations from the point of view of macro economic policy making, although not - it is worth noting - from the perspective of euro/dollar market participants, and it is not surprising that the combination of yesterday's news about the IFO reading and this GFK one has finally sent the euro through the 1:50 barrier. 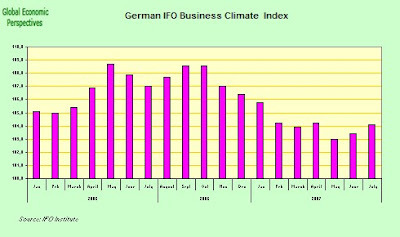 The Munich-based Ifo institute said yesterday that its business climate index, based on a survey of 7,000 executives, increased to 104.1 from 103.4 in January. But as we can see in the chart below this rise was only a very moderate improvement, and the change was largely in the current conditions component, without much significant change in the longer term outlook. The dollar in fact went up as far as $1.5047 per euro, the lowest since the European single currency was introduced in 1999, before trading at $1.5017 as of 6:47 a.m. in London from $1.4974 in late New York yesterday. The euro reached a six-week high against the yen as traders continued to bet the ECB will keep its 4 percent rate unchanged in coming months, with euro falling back to 160.56 yen after reaching 161.39. Obviously what now gets to happen next would seem to be anyone's guess, since we are well past the point were previous experience could be considered a sure guide. Clearly one possibility is that this euro "rally" will rune out of steam (but would we be right at this point in treating this simply as a rally, may it not be more a structural by-product of something or other, see below). For one thing, for the euro to receive a substantial downward correction one has to assume that the US treasury would simply sit back and let it happen. 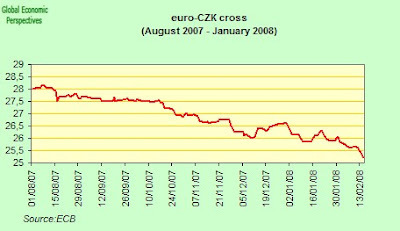 But the US is itself in the midst of its own hard fought "dollar correction" which is seen as being essential to correct the current account imbalance, so at the present point the US Treasury are far from being unhappy with the current state of Euro-USD, and they could resist anything which smelt of a sharp upward correction in the dollar, maybe even by selling dollars. I am sure they would accept a moderate downward adjustment, say - guessing for illustration purposes - to 1.40. But I am not sure they are ready willing and able for a major upward hike in the dollar. Nor are very many people in the financial markets anticipating this outcome, even though the macro economic data we are seeing would be much more in harmony with such a view. Again, neither the Japanese and nor the Chinese would be especially happy about the advent of a "cheaper euro" since they have been tending to regard the European markets as a convenient fall-back position in the face of a weakened export market in the United States (and it might be interesting for someone or other to explore what the Russians and the Gulf-peggars would be looking for at this stage). Basically there are some pretty hefty players at the central bank level out there pushing their own interests, and many of these will not coincide with the forward looking macro concerns at the ECB, so we need to try think about and monitor how they respond at each given stage. Basically, as I have been arguing, there are two opposite tendencies at work here. A short term one for the dollar to fall vis a vis the euro, and a longer run one whereby both of them have fall against an as yet unspecified basket of currencies. The basket may be unspecified, but my guess is that the rupee and the real will be in it. Possibly the Turkish lira. In fact how all this might pan out is that those who are left in the basket of emerging market currencies tracked by Bloomberg after the coming correction is over (ie, for example, after Eastern Europe has been forcefully stripped out) might well go to form the emerging nucleus here. So market realities rather than G7 policy may well be the final determinant here, which I suppose, given the zeitgeist of the times, would only be appropriate. What I am trying to work out as all this moves forward is what weighting (in that mental topological map we all carry round in our heads I mean) to give to each of the processes - the short one and the long term on I mean. Up to the end of last year I was always expecting a euro crash against the dollar (since the underlying longer term macro seemed to suggest this), but then so many things have happened that neither I nor anyone else was expecting (I WASN'T expecting so many immigrants to arrive in Spain over the last 5 years, for example, and I wasn't expecting the Japanese housewives loss of home bias, nor the way in which local central banks could lose control of monetary policy etc etc) that I think the only thing to beware of at the moment are the "we've seen all this before" type of arguments". So now I am not so sure at all what gets to happen next, and I am would be simply arguing for keeping a semi-open mind, and following closely what actually happens as it happens. This is also the case since there is no easy and obvious solution that suits everyone here, and that is always a problematic factor. 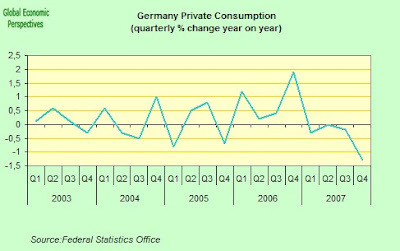 Meanwhile, the German economy is visibly slowing. The detailed GDP data were out earlier in the week, and quarter on quarter growth is slowing steadily and inexorably. 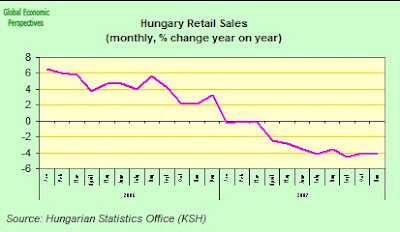 while houshold consumption has suffered a complete slump since the heady days of the pre VAT hike in Q4 2006. 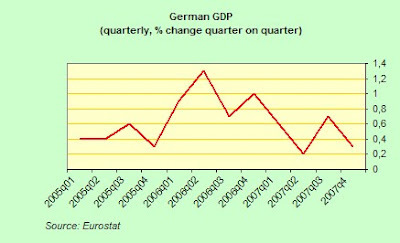 And it is not simply the German economy that is slowing, none of the "big four" could be argued to be in perfect shape. Italy may already be in recession. ISTAT haven't even had the stomach to release the Q4 2007 numbers yet, although everyone who will have seen the provisional version of them has been busily revising down the 2008 outlook considerably. Almost all the macro data we have seen coming out of Spain over the last three months (retail sales, industrial output, services activity, consumer confidence) has been unequivocally bad. Strangely the only vaguely positive reading was Q4 2007 preliminary GDP data, and we are still waiting for details to try and understand why this should be the case. Spain seems to have had a bank loan sudden dead stop in December, and according to the latest Eurostat release construction activity is now falling heavily (down 9.5% year on year in December). So we now seem to face the very preoccupying possibility of a credit crunch and systemic banking crisis feeding into a naturally slowing real economy. The only vaguely positive outlook among the big four would seem to be in France, where performance is holding up rather better than the rest, but how long this will prove to be sustainable if the rest continue to head south is a very moot point indeed. Germany continues to constitute the major puzzle for many observers. Job growth continues, but at the same time consumption slides. Evidently with so many older workers being sucked into employment the bang per buck in jobs for consumption terms seems low, and many of the jobs being created may have a very low real economic content. 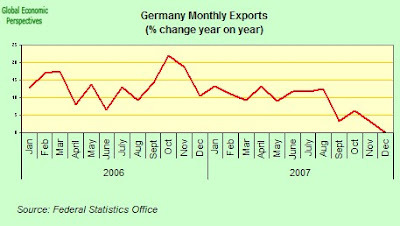 On the other hand, despite some slowdown of late Germany is apparently exporting and investing like hell, but what the question we need to ask ourselves is just how vulnerable that may be to any problems which boil over in Eastern Europe. Basically German export growth is highly interlocked with growth in the EU10, and to a lesser degree Russia, Ukraine, Serbia, Croatia etc. Some of these economies are still accelerating very rapidly - Poland, Slovakia, the Czech Republic, Romania Ukraine, Russia etc - and obviously Germany is getting a lot of very positive spin off from this. But much of this frenetic growth this isn't going to last very long. 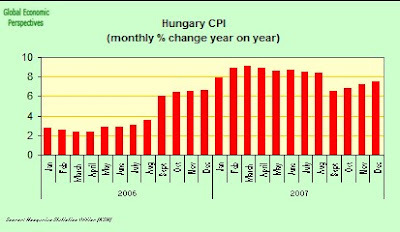 The strong uptick in inflation across the whole region suggests that one economy after another is now overheating, and some who have already blown out after the over-heat are now steadily "cooling" - Latvia, Lithuania, Estonia, Hungary, possibly Bulgaria. So how far are we away from all this overheating producing a sudden bout of "cooling" in a wider group of East European economies. Months at the most I would say. And if this view is right, and Germany can no longer continue to boost sales in Eastern Europe to get growth, what does that tell us about the ability of its export dependent economy to stand the pressure of a very high euro-dollar as we move forward? This I think is the key question we should all be asking ourselves at this point. Just as we are nearing the transition from Winter to Spring here in Europe which traditionally promises to bring more pleasant and mild weather it seems as if Eastern Europe might just be getting a much welcome dose of cold air to quell its many overheated economies. This fresh breeze of cold air was inevitably coming in helped along from the breath of the illusive credit crunch and essentially it is also, in this respect, much welcome. 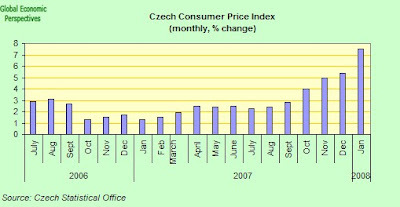 Yet, the issue which now confronts Eastern Europe and many of her economies is not so much the confusing sequence of seasonality but rather how not to freeze over completely and tumble into a hard landing. Here at Alpha.Sources and elsewhere I have been adamant in my description of the issues in Eastern Europe and how I think the situation may turn out worse than many observers think. None of us know of course; we can merely asses the facts as they are presented for us and follow closely the incoming data. Two recent very worthwhile contributions to the debate on Eastern Europe and more specifically the Baltics are presented to us in the context of RGE's Euromonitor where Christoph Rosenberg and Karsten Staehr posts separately on the topic at hand. Christoph and Karsten seems to more or less agree with respect to the main thrust of their arguments. Both authors write in the context of a recent conference organized by the IMF and Eesti Pank where the Baltic situation was discussed. Karsten also refers to his recent article in the monetary review from the Danish Central Bank. Both the authors in question field arguments which are somewhat different from my own and my colleague Edward's and in this light I think it would be most interesting to go through some of the points and see whether we cannot learn something from each other? The positive side effect of this [the subprime crisis] is that indebted borrowers in Estonia, Latvia and Lithuania will not face larger debt servicing payments, which again may reduce the likelihood of widespread bankruptcies. The global financial setback may thus have led to exactly the form of financial restraint that the overheating Baltic countries need. 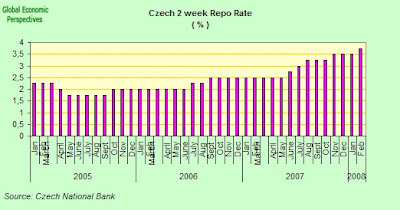 This is kind of reverse causality relative to the way I have traditionally narrated the credit crunch in the context of the Baltics and Eastern Europe. However, this does not mean that Karsten is not right in the main. 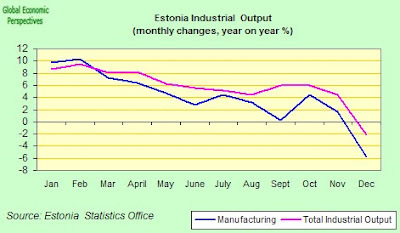 My main gripe would be that the slowdown was bound to come anyway as the labour market tightening and subsequent credit fuelled wage growth was bound to finish at some point entirely because of reasons endogenous to the Baltic situation. In this light, the credit crunch hardly comes at a convenient time since it may lead to the credit and financing of the external balance being pulled too quickly. These pegs have proven to be remarkably resilient, surviving the Russian crisis as well as recent attempts by outside market players to take positions. Speculators have not found a chink in the armor because the spot market is tiny and a forward market non-existent (contrary to the impression generated by those quotes on Bloomberg screens). From the Baltic governments’ point of view, abandoning the euro pegs, even in the face of mounting external pressures, would likely create more problems than it solves, given that many households and enterprises have borrowed in euros. The illiquidity, or in the case of the forward market non-existence, of the FX market in the realm of the Baltic currencies is an important case in point. It is unlikely that the Baltics will be the first in line in connection with a potential currency run in the context of Eastern Europe. That dubious honor seems to have landed at the front step of Hungary and Romania. 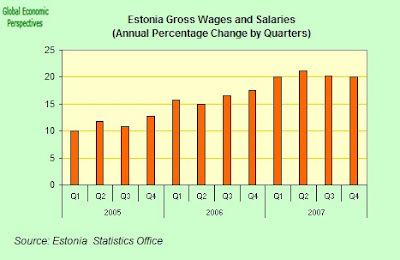 However, the fixed exchange rate regime represents another mounting problem for the Baltics in the current situation. How are they going to correct? This brings us into the heart of the predicament in my opinion and thus how the Baltics are in a bit of a bind. Consequently and as Christoph himself points out fiscal stimulus can not be used to counter the current downturn since in the end we are talking about a deficiency of external and not internal demand. Yet, this is also a textbook case of the ever recurrent trilemma often cited in the context of international economics. With free capital movement and a fixed exchange regime monetary policy is out as well as is de-valuation. Moreover and as noted, since fiscal policy also seems to be out of the question (some are even talking about a contraction) we are basically letting the reigns go hoping that the chariot won't fly off the cliff. Those of you with Austrian inclinations would undoubtedly be cheering away at this point emphasising out that this is the one and only way that these economies can correct. This is a discussion for a separate post but suffice to say that there is a distinct possibility that all this will end in deflation since absent the adjustment mechanisms cited above this is the only conceivable way to break the vice. It is important to note that there is nothing deterministic about this scenario but it may in fact happen. And once we allow ourselves to consider the possibility we need to ask whether it wouldn't really be better to devalue in order to restore external competitiveness? However, this can hardly be seen as an ideal outcome either since as Christoph notes in a faint sentence, and as I have analysed extensively, Baltic enterprises and households would be severely exposed as a large part of the outstanding stock of loans are denominated in Euros. This brings us back to the question of deflation and whether the foreign banks would stay put in such an execrable macro environment and ever so important how such an environment would affect the tendency of net outward migration. I cannot say that the chain of events will play out as I am suggesting. But there is a risk. In the concrete context of Karsten and Christoph they both seem to end their analyses on a somewhat open note with a tendency to lean towards the soft landing scenario. 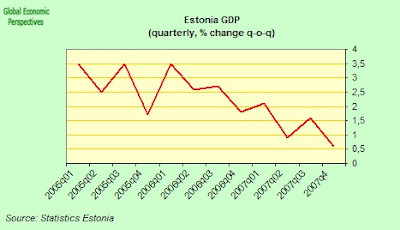 The figure clearly shows the very high trend growth in the Baltic countries, only interrupted by the downturn in 1999 as fallout from the Russian crisis. Given the low initial income levels, part of the impressive growth performance can probably be explained by ‘catch up’, where import of technology and organisational knowledge speed up growth. 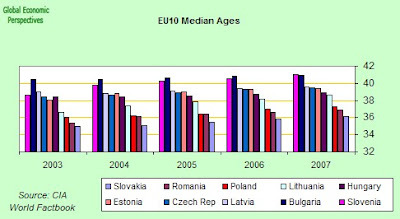 In 2006, the purchasing power adjusted GDP per capita in the Baltic countries still amount to approximately 50-60% of the EU27 average. This is indeed the case but take note. The lowering of these expectations may be much more permanent and enduring than you might imagine and as such it is rather important that the tumble is not too rough. 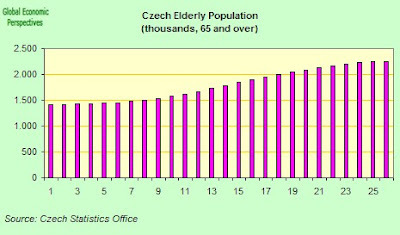 I guess that my main addition to Christoph's list of solutions as he presents them is quite simply that we take a look at the demographic edifice of the region and individual country since if we don't, the situation is not likely to improve much in the long run. The risk of contagion. 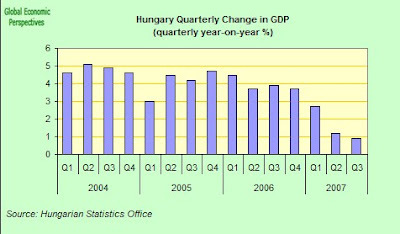 Events in Hungary and Romania point to a deterioration of economic fundamentals by the day. The laws of economics do not as such prescribe that this need to affect the Baltics but since the underlying issues are much the same I do think that the risk of contagion is there. The most important potential transmission channel of such contagion would be the extent to which a debt crisis and subsequent withdrawal of foreign credit in one country could lead to similar events in another country. The lack of adjustment mechanism due to a fixed exchange regime and translation risk due to unhedged cross-currency liabilities of households and corporations. 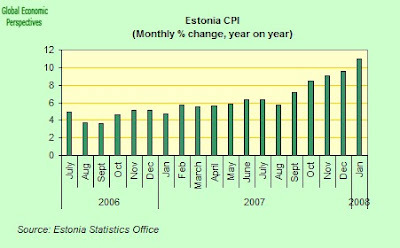 The main risk as I see it is that one or more of the Baltic countries will slip into deflation on the back of the current slowdown. The alternative which would be to un-shackle from the Euro hardly seems positive for two overall reasons. Firstly, the ensuing debt burden levied on economic agents in possession of Euro denominated loans would be quite severe and secondly there would be political issues as the prospect of future entry into the EMU would be seriously dimmed. Finally, I tend to assign a rather strong weight to demographics as a variable in this whole situation. In my opinion a large part of debacle many Eastern European countries now find themselves in is due to their unique demographic situation. Focus is needed here I believe and especially we need focus on attempts to raise fertility and to keep people from leaving. 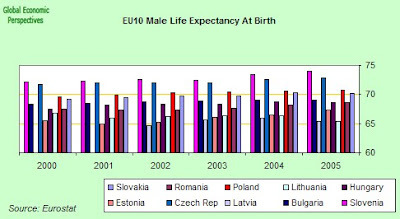 As a Dane I see how those Polish plumbers have been a most welcome addition to an overheated Danish construction industry and I can also see how Ireland and the UK have benefited from Eastern European labour. But, we need a more balanced focal point on this and one which also takes into account the impact on the sending country. Remittances are fine indeed and so are claims that migration is temporary but this is also part of the whole edifice. 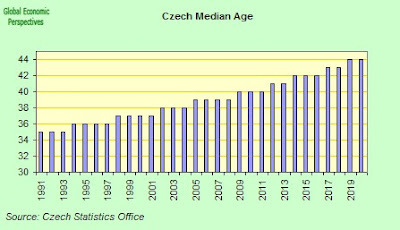 In this way, the degree to which Eastern Europeans choose to stay in their current country of residence seems to be somewhat proportional to the potential severity of the current slowdown. Leslie Crawford had another very useful article in the Financial Times last week (a handy addition to this earlier one). According to Crawford the Spanish banks are accumulating a “war chest” of assets to be used later as collateral to access European Central Bank credit in the event their liquidity needs rise even while wholesale money markets in asset backed paper continue to remain closed to them. It is important to remember here that the huge expansion in mortgage credit in the country in recent years has been largely fed by the banking sector’s widespread use of mortgage-backed bonds to fund lending growth (the so called Cedulas Hipotecarias, see my post on this here), and that the Spanish banks have been second only to the UK in Europe in this respect. In recent months, and with the Cedula market effectively shut, Spanish banks have been steadily increasing their use of funding from weekly liquidity auctions conducted by the ECB, which has long accepted mortgage-backed bonds as collateral. The banks have done this by securitising pools of mortgage debt, which they keep on their balance sheets rather selling, and these are pledged to the ECB in exchange for funding. 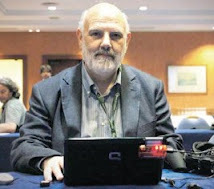 Now I am macro economist, rather than a banking specialist, and it is not immediately clear to me what the banks who are doing this hope to achieve in this way, since if they are themselves effectively having to buy their own bonds using cash, and cash is at the end of the day even more liquid than bonds, where is the benefit? One answer could be that they are issuing new mortgages backed by these bonds, and then using the bonds as collateral for the ECB loans, in which case they are effectively swopping cash - which earns of course no yield - in their reserves for securities which do pay yield, since indirectly this yield is paid by those who pay the mortagages which are being used as backing (and are of course themselves "illiquid"). The recent widely publicised offer by Banco Santander to take-over mortgages (and customers) from other banks, always providing that these mortgages originated prior to 2002, could be an indication that this is in fact the objective. But again all of this only makes sense if the banks in question are increasing their reserves as a "war chest" against anticipated future losses on the mortgage side of their business, and what we need to think about from a macro economic point of view are the implications of this increase in the cash reserve ratio (ignoring for the moment the fact that they may be doing this via the "eating their own" bonds technique, which may reduce the damege to bank profitability, but does little to offset the money supply contraction implied as far as I can see). Certainly this would seem to imply yet another channel of indirect credit tightening. And of course none of this tells us very much about two crucial questions: what the rate of new mortgage issue is going to be moving forward (since the banks are offering a maximum loan to value ratio of 80% in an environment where few people have savings), and what the position of the smaller - regional cajas - banks is here, since they are evidently the most exposed to the whole problem. The cedula-backed bonds have been largely issued on a 10 year renewable basis, and start coming-up for rollover in substantial quantities after 2010. Basically some 300 billion euros need to be "rolled over" during 7 years, and since the existing holders are likely to cash in, it isn't at all clear where the regional cajas are going to find the resources needed to do this. So could the Spanish government be faced with an inevitable "Northern Rock" type solution here? This is doubly the case, since noone at this point has any realistic idea of the actual forward path of Spanish property values over the 2010 to 2017 horizon, and this is basically the reason why the asset back securities market is closed to Spanish products - and unlikely to open any time soon - and basically why the cedulas are so different from the German Pfandebriefe (with which they are so often compared) since the latter where sold on the market AFTER the correction in property prices following the end of the 1995 boom, and were thus pretty resistant to further downward movement, and in any event in the German case the bonds were ultimately backed by government guarantees to the deposit holders in issuing banks, and so in this sense the investment grade rating had a certain logic to it. So we only have questions here as we move forward. Nonetheless recent Spanish banking data does make interesting reading. According to data released by Spain's central bank, Spanish banks doubled their share of the ECB’s weekly funding auctions in the final quarter of last year, taking their borrowing up to €44bn in December from a running average of about €20bn over the previous 15 months. This extra lending from the ECB of almost €24bn outstrips the quarterly amounts raised previously by Spanish banks from securitisation markets, which is an important comparison because the banks have increasingly used mainly mortgage-backed securities as collateral with the ECB. This jump has increased its share of Europe-wide borrowing from 5 per cent of the ECB’s total to 10 per cent, a number which more or less proportional to the weight of Spain in the eurozone economy, but what is so striking is the rapid rate of expansion. Before this money wasn't needed, and now it is. 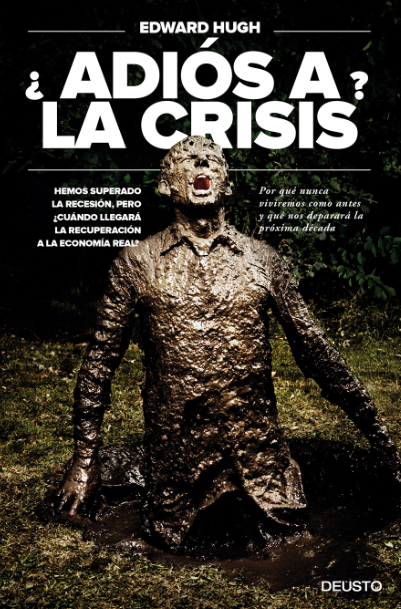 Jean-Claude Trichet, the ECB president, who in fact came on a vistit to Spain only last week, went out of his way to stress that in no way was the Spanish or any other eurozone banking system being bailed out. “We have not changed our rules [in order to accept mortgage backed bonds],” he is quoted as saying. Another noteworthy detail about this sudden "eat your own bonds" expansion, is that larger amounts of securitised bonds are being created appears to be being used. Santander, Spain’s largest bank, said it has €30bn in loan-backed securities on its books that it could use as collateral, while BBVA, Spain’s second- biggest lender, has €60bn in such bonds available. Popular, a mid-sized bank that relied on wholesale markets for 42 per cent of its funding before the credit crisis, says it has €11.4bn in bonds that could be used in ECB auctions, but says it has to date not resorted to raising funds via the ECB. So the bottom line here is that the European Central Bank has effectively been indirectly responsible for funding new lending in Spain in recent months, replacing banks’ traditional use of wholesale capital markets, since these have been effectively strangled by the global credit crunch. And so there is one last point to think about. 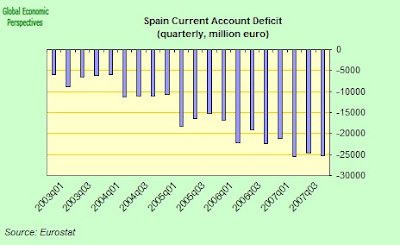 Spain has been running a substantial external deficit, one which it needs a constant inward flow of funds to underpin. 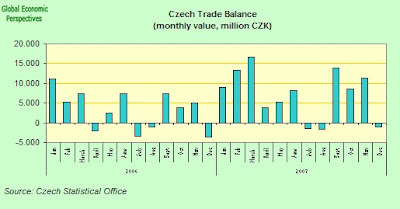 During the last seven years, external funding into the cedulas (which ammounted to some 60% of the total) essentially offset the deficit. But now these flows have stopped, so how is Spain going to finance its deficit? Another way of thinking about this would be to say that private borrowers were effectively attracting the funds into spain which then paid the current account deficit. Or if you prefer, (on a sort of back of the envelope basis) not a single barrel of oil consumed in Spain since 2000 has to date been paid for. It has all been supplied on tick. So the problem now is that not only does Spain actually have to start paying for its oil, it also has to pay back all the oil which was consumed between 2000 and 2007 (as it will discover when "rollover time" on the cedulas arrives). Or is the ECB also going to reinvent itself here, becoming payer of the last resort on the individual national external deficits? I realize that I am moving in a bit late with this but the data I use to input in my analysis only recently came out for December 2007. More generally, this post is going to be quite big since I have a lot of things I want to get off my chest this time around. I have two main areas of focus I want to cover. 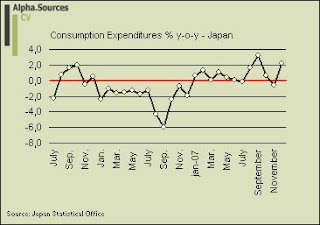 Firstly I want to finalise my analysis of Japan in 2007 with the December data for consumption expenditures and prices. Secondly, I want to continue with a general assessment of two of the main market points in Japan at the moment. The Yen and the BOJ rate policy faced with an incoming slowdown and potential recession. The risk of dual recession is mounting. Our US economics team is already calling for capex-induced negative GDP growth in successive quarters (Jan-Mar, Apr-Jun), for a technical minor recession in the first half of the year by definition. We are forecasting that Japan will cling on to a modicum of growth in the Oct-Dec 2007 quarter, boosted by external demand, but there is a possibility that, like the US, that quarter will mark the peak and the economy will retreat in Jan-Mar. Future data for industrial production will tell us if this is the case. If we begin with prices we see that inflation, at a first glance, seems to have returned to the shores of Japan even to such an extent that I will soon need to adjust the y-axis of my graph (and yes, this is an apology for a sloppy excel graph). Yet, the most important point to take away from this is, as I have been at pains to hammer home before, the disconnect between the inflation indices. Core inflation as measured by inflation ex food and energy prices is still in negative territory whereas the general index is shooting up thanks to headline inflation. This disconnect suggests that the inflation we are seeing in Japan is not driven by demand factors (demand pull) but rather by supply factors (cost push) and thus this does not signal an impending Japanese recovery. Quite the contrary in fact as the spurt of inflation at this particular point in time will only further pinch an already troubled Japanese consumer. 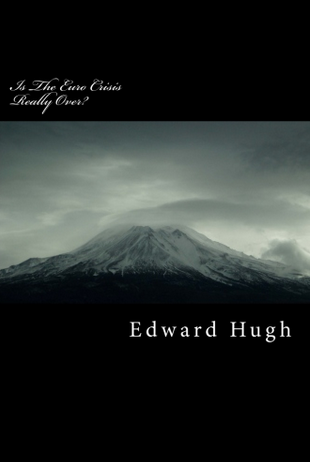 Edward also moves in with a much worth while analysis of the inflation issues in Japan. A key point here will be the extent to which future inflation readings will have a bearing on the BOJ's decision to actually move in with a cut in the already low interest rate of 0.5% in order to accommodate a slumping economy. I don't think Fukui will cut rates before his term ends this spring and given the debacle which may arise in the context of finding a new governor it seems that economic fundamentals should not be the only thing to watch in order to make a call. What seems obvious however is that if inflation pressures suddenly show signs on abating the door will be open for a cut. If we turn to the indicators for domestic demand proxied by various measures of consumption expenditures we can also close the book on my forecasts for 2007. 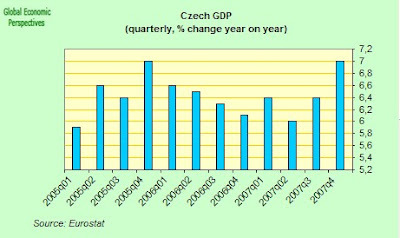 As such, I dared to venture that growth in consumption expenditures would not increase by more than 1% on a y-o-y basis. Let us look at what we have. Firstly, I think that the Yen demands some attention. Recently, I noted how the Yen was driven by anything but macroeconomic fundamentals. This clearly still seems to be the case. However, the main question is when this will end? At the moment and if you look at the FX price action in the beginning of 2008 almost all Yen crosses have been correlated with the stock market and thus by derivative the general sentiment of risk aversion in the market. This is nothing new in the sense that since the subprime market hit the global economy in the middle of August 2007 the Yen has been the main canary in the coalmine when it comes to the risk sentiment in the market. Yet, the Yen is not only driven by cyclical factors. As such, the decline in home bias of Japanese investors as well as the general yield disadvantage of Japan suggests that all those talks about an undervalued Yen aren't clued in to what is really going on in the sense that what is really the fair Yen value at this point? We need to think about the fact that the whole global economy seems to be undergoing the initial phases of a much more structural correction (recoupling) and in this context it is difficult to see how the Yen can stand its ground. It might not happen today or tomorrow but I have difficulties seeing how the risk aversion dynamic can hold the ground for the more wider and structural trend. Turning to more immediate drivers of the Yen the potential that Japan would intervene in currency markets to cushion the Yen's depreciation has reared its head with regular intervals. Back in early November I asked the question putting the limit at 105 for the USD/YEN which. Various other estimates have been around. Morgan Stanley's Stephen Jen puts it at 100 which is just the same as Macro Man. Recently, currency strategist at Dailyfx Boris Schlossberg kept the speculations alive suggesting, as me, that 105 just might be the threshold for Japan. Currently the Yen is hovering in the region of 106-107 and in this light Boris' conclusion seems to be a sound one, if a bit noncommittal, to take with you in the trenches of FX trading. While there is certainly no guarantee that the BOJ will intervene at the 105-100 area, economic factors and positioning data suggest that Governor Fukui and company may indeed opt for that solution. Given that possibility the above mentioned strategies should hopefully minimize risk and optimize return for both momentum and carry traders. At the very least traders should pay particular attention to the price action if USDJPY slides down to the 105 level in the near future. From a macroeconomic point of view this makes sense. Japan is largely dependant on exports to fuel growth as well as need to remember that an appreciating currency is deflationary and Japan has not escaped those fangs just yet. As for the Yen all evidence seems to point towards a continuation of current trends for the immediate future with the Yen acting as a global parameter of risk and investors' risk aversion. In this light, the risk of intervention needs to be weighed in as a potential market mover as we move forward. The second topic I want to cover has already been mentioned above and essentially also cuts across the whole discussion on the Yen. In short, what will we see from the BOJ? Perhaps the most important thing to note here is that before we get to the discussion of what exactly the policy rate will be as we move forward into 2008 the BOJ will need a new governor. As I noted in my long end-of-2007 note this may well turn out to be quite a messy affair. Whether the shift of guards at the BOJ will turn into the political gridlock many observers have indicated is difficult to see from my desk here in Europe. However, there are some clear risks. As I have argued before a situation of political stalemate in which the Democratic Party of Japan (DPJ) will use their majority in the upper house to stall the nomination of a new governor will, all things equal, bring the MOF closer to monetary policy making. Basic logic would, in such a situation, call for a freeze of the nominal interest rate until the new BOJ leadership is set to assume their seats. However, if this current slowdown turns for the worse it may provoke measures which at this point in time might seem unrealistic. One risk is thus that Japan re-enters ZIRP over the course of 2008 and that this happens sooner rather than later. Before this materializes however, I am quite happy moving in behind the Morgan Stanley team in forecasting a cut in the main refi rate for Q2 2008. A lot of ground has already been covered in this piece and as such I think it is time to move in with some summarising remarks. I had two main objectives in this note. 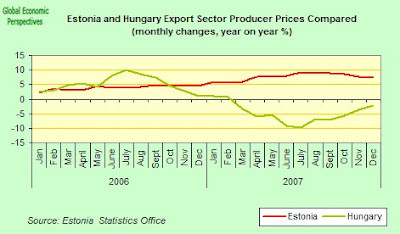 Firstly, I finalised my monthly analysis of consumption expenditures (domestic demand) and prices for 2007. 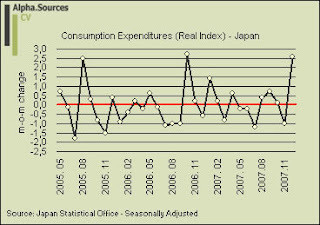 Even though 2007 most likely will go down as a rather strong year in relative terms the failure of the overall consumption expenditure gauge to break the 1% threshold YoY tentatively suggests that domestic demand cannot become a driver of growth in Japan in any given sense. This point was underpinned by the monthly and long terms indicators of consumption. In connection to prices, we observed how inflation seems to be coming back to Japan. 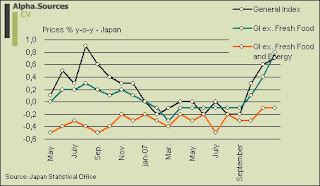 Yet, if we strip out energy and food Japan is still stuck in deflation and even though the core-of-core index might also nudge up towards positive territory the transmission mechanism from headline inflation to core inflation does not suggest that the inflation pressures we are seeing are driven by buoyant domestic demand. This does not warrant complacency against inflation but tells a story which needs to be told I feel if you really want to understand what is going on in Japan. I also had a brief look at the Yen and more specifically the driver of the currency. I concluded that while risk sentiment seems to be the main trend explaining the current movements more general structural forces should not be neglected. The key issue here is timing and thus the dynamic relationship between the immediate environment and the more long term structural trends. Moreover, I also reviewed the latest speculation that we will observe intervention in the FX market by MOF and the BOJ. At this point, we have no clear indication that this will occur but I think the possbility should be entertained that the MOF will dip its toe at some point. In terms of the the BOJ and a subsequent call on the rate policy in Japan I moved in behind Morgan Stanley noting that Q2 2008 will see a cut to 0.25%. Another factor which I discussed was the extent to which the departure of governor Fukui will result in a policy gridlock. The risk is definitely there I would argue and it is a possibility which should be taken into account. I think that such a gridlock would (and should) result in a an effective standstill of rate movements but if the slump turns for the worse new dynamics may come into play where the MOF moves in to 'politically' steer down interest rates. Whether 2008 will see ZIRP is still an open question I think. I believe the probability is fairly high not least because I think that the recession we are now seeing on the horizon may very well be more severe than many expect. The main question however is not centered on the slowdown in Japan per se. This is the nature of economic cycles in the sense that they go up and down; yet, what remains the most compelling question in Japan's case is just how far and how long it will be this time.